i've entered a contest to win a gift certificate to fiesta farms, aka the best grocery store ever! would appreciate a vote - no registration is required, just give my dad food story a five-star rating please! it was actually writing this entry and thinking about my dad that inspired the scones & devon cream recipe i posted the other day. first cottage trip of the year! 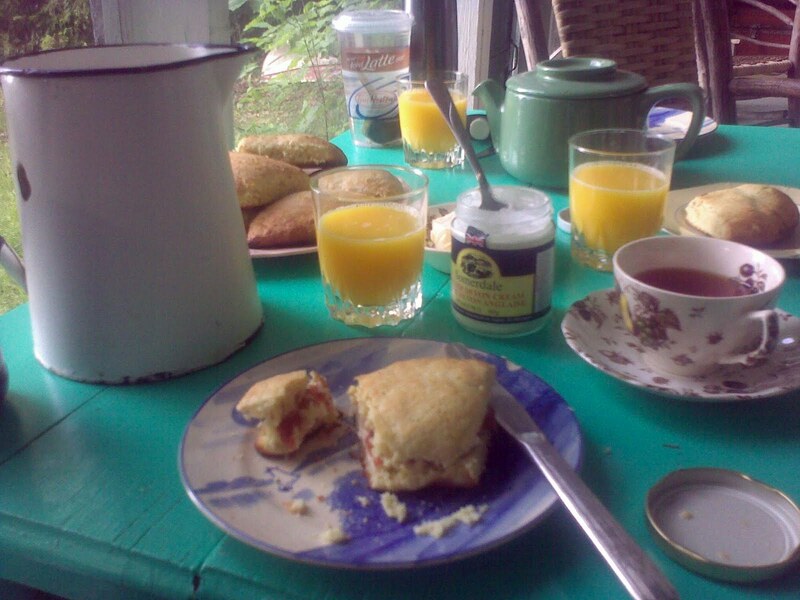 finally got up to the cottage on the weekend - just a quick overnight trip, a swim, a game of "sorry," and scones for breakfast (recipe below) with devon cream and strawberry jam. yum! 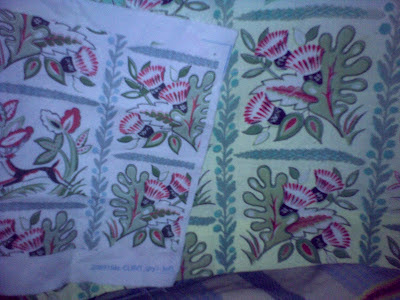 and the spoonflower experiment worked out quite well i think! the pattern is a bit on the small side (totally fixable), but other than that, i think the colours are spot-on. now, to figure out how much to order! the original curtain fabric it's replicating goes back decades - the family has been going to the cottage since 1929 or 1930 (memories are a bit hazy... i think it was rented in 1929 and bought in 1930? ), and the cottage is a lovely time capsule. and, i got one of my fenelon fair projects close to finished - "child's vest, knit or crochet." 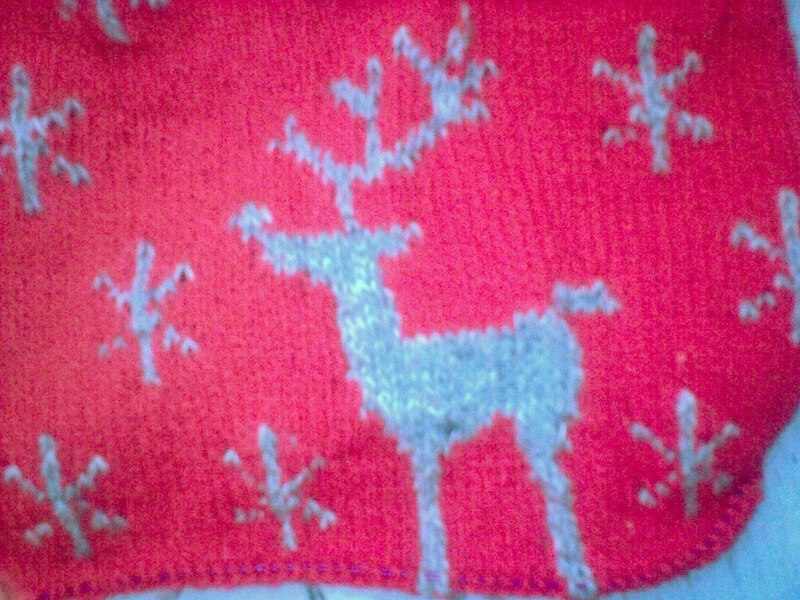 i was so pleased to get the reindeer done, and the kiddo is excited to get a sweater with no sleeves for xmas. just need to add ribbing! add milk and eggs, mix with fork. form into 2 rounds, 1/2" thick. cut each into 4 wedges. bake on a greased cookie sheet for 15 minutes at 450f. need to find that camera! i have no pics of the cowichan-style cardigan i made for the kiddo, no decent pics of the vest i am working on currently. and we're going to a birthday party saturday, and after that, the cottage! so i will finally get a chance to compare my curtain fabric against the actual curtains, and see if i got the colour and scale correct. i'm thinking too, i made an all-over oak-leaf pattern which i might want to make more random. but mainly i just want to see if the colours are good so i can place an order and start quilting! three cheers for knit nights, for companionship and inspiration. two long years after i started, i have finally got the spring dreams dress to the point where i need to switch to smaller circs to do the ribbing at the waist. yahoo! 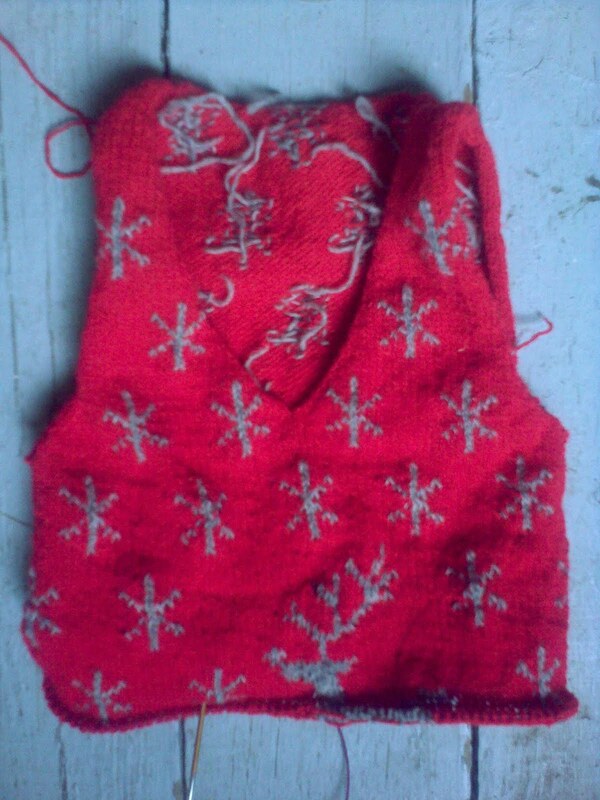 now i can move it to scrap yarn and use the circs it's been on for the reindeer sweater! someday, i will finish something. someday. caught up with 8 eps of mad men on the train last week, and started strategising for the fenelon fair. i went through the prize list, made a list of everything that made me think "oh, i'd like to do that," and then ordered it by done-ness/doability. 2 sections are already covered (child's cardigan - the space invaders cardi for the kiddo; and infant's knitted dress - the daisy dress i started eons ago but never actually finished until a month or two ago). those, believe it or not, are already tagged with sample materials attached. whoo! next, are the half-started projects, the xmas pyjamas that were already cut and pinned, the "ladies sleep pants" (aka pj bottoms) i'd already bought fabric for, a child's top-and-shorts set i'd been meaning to make and had fabric for, etc. since i started focussing on this a few days ago, i've got the xmas pjs thisclose to done, have cut out the fabric for the sleep pants (actually a whole set of pjs), and cut and pinned the top-and-shorts. there are more projects on this list too, that i've already had in mind to the point of having bought the materials. the next category is the pipe dreams. sure, i'd like to make a quilt. and there will by xmas decorations made, i could just make them early. ha, ha, ha. final category is baked goods that i won't worry about till the week of. i see ribbons in my future! "that is the most canadian sweater ever"
so, last fall i had many cryptic posts about a mystery surprise knitted christmas present i was working on. but once it was done, i never somehow got around to posting photos here! there are many and numerous step-by-step pics on ravelry, but i hadn't taken a decent photo of the grateful recipient, and then we had such a mild spring and early summer he hadn't worn it in a while. but lo and behold, the advent of june appears to have brought with it an early autumn (i hope i'm kidding), so out it came! how gratifying when we were out last night and a friend of his was amazed (that is where the quote in the title of this post came from) and impressed that i had actually made it myself. this afternoon i got a few snaps! inspired by this sweater belonging to grant lawrence, i knit it over the course of three months of subway rides and work lunch hours, never pulling it out at home unless my husband was guaranteed to be gone for hours. i used just about 8 bales of briggs & little country roving (with the leftovers going to the invadin ur space sweater i'm currently working on for the kiddo). a rainy day today, so i rode the bus and brought my knitting! didn't do any knitting, mind; last night, i finished the first sleeve of the invadin ur space cardigan i posted about yesterday. while watching forbidden planet, no less. 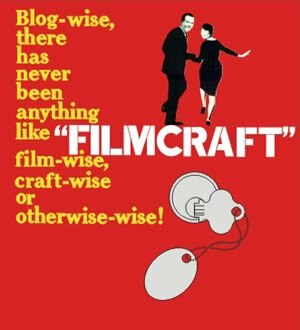 sometimes it's difficult when watching an old film to let go of the commentary and actually just watch it. so instead of just watching, we had fun experiencing it as an artifact. look how young leslie nielsen is! check out the painted backdrops! the electronic tonalities are beyond crazy! can you believe that robot cost $125,000! ... and on, and on, and on. anyway. my point was, i couldn't knit this morning as i needed a chart. so instead of knitting, i brought a printout of a blank sleeve chart, and a picture of the beastie i wanted on the sleeve, and charted him up on the bus. a cleverer person would have printed these things out to the correct scale, held the papers against the window, and traced. i sadly am not that well-organised and was already on the bus when i realised it wouldn't be that simple. in any case, the chart is done, and i'm ready to cast on!